Well what have I done? I have just finished my baby blanket that I was busy with in February. This is for my sister in law’s little boy, due at the end of July. We are about 6 months pregnant. Yes it’s a boy! Bit of a letdown since aunty was hoping for a little girl! Now I need a new project for the hook? Yes! No problem! I started 2 new hooking projects! This is for “LookC”, my beautiful 5 year old little niece! Better get going as winter is on its way here on the most southern point of Africa! If you had told me this in the beginning of the week I would have not agreed. It’s being very hot around, 30˚C! Now it cold and rainy! 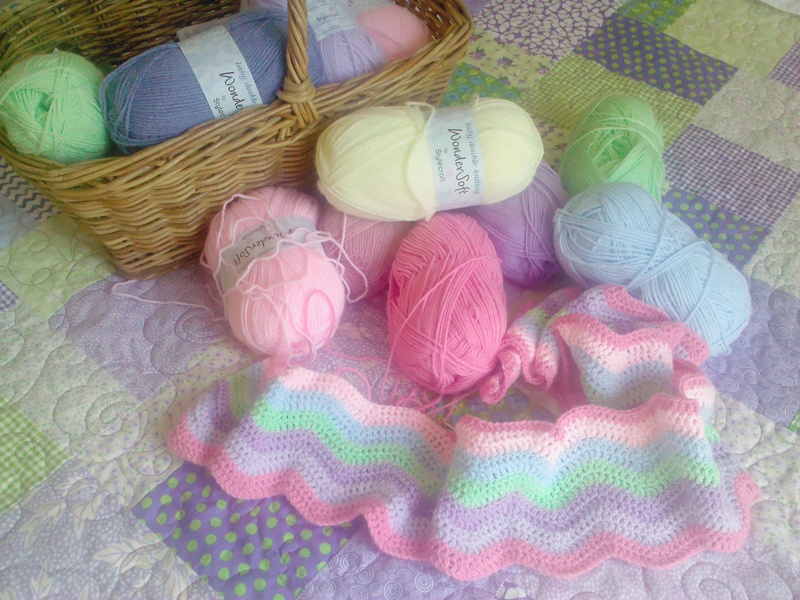 This is Lucy’s Ripple Blanket pattern for Attic 24, I’m using Stylecraft Wonder Soft yarn. The second hook project is a random granny square, crocheting different sized squares as I go! I’m using a local yarn, African Expressions, Joy. You will have to watch this space to see the end result. I’m a bit worried, as my fingers are starting to itch to knit a pair of socks! This entry was posted in Craft sewing, Crocheting and tagged African Expressions Joy, baby blanket, buzy day, Craft, Crocheting, NikkiM, Stylecraft. Bookmark the permalink. I love granny squares. Can’t wait to see it finished. I’m enjoying crocheting this blanket! I love all the blankets and can’t wait to see the progress on the Granny Squares! Great work! I enjoy crocheting at the moment! Thanks for visiting my busy day. I can’t think of anything better to be busy with than a good bit of crochet. It all looks lovely Well done. Enjoy it. Thanks for that! It great fun! Thank you for your kind words and for visiting buzy day blog. Your projects look beautiful. Makes me think I need to get out my crochet hook. Thank you for your kind words and visiting my blog. I love granny squares. The colour potential is excellent! It’s a shame I’m the worst crocheter ever. Just do it! Its lots of fun! Mine are not that good! Thanks for visiting my buzsy day blog.